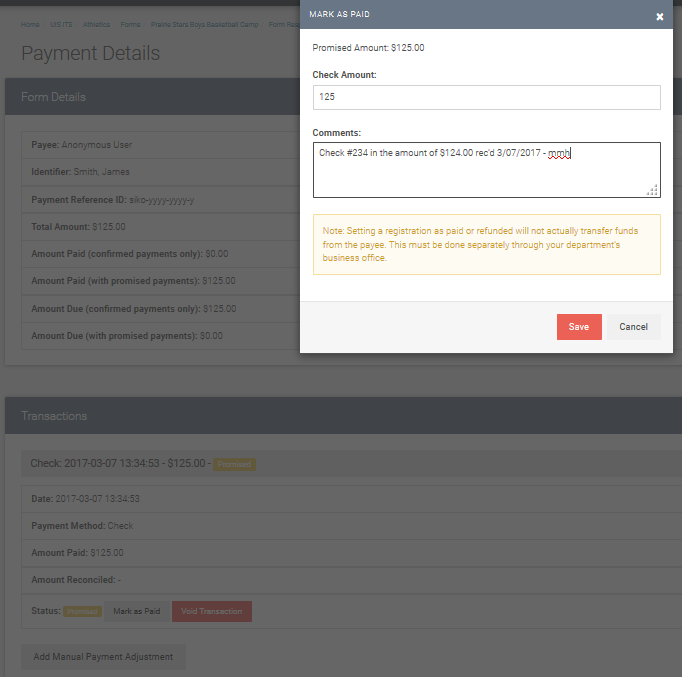 FormBuilder forms that capture check payments from users require manual intervention from the unit administrator or form group administrator to reconcile the check payment once it is received. This document explains the process of reconciling check payments once the check has been received. 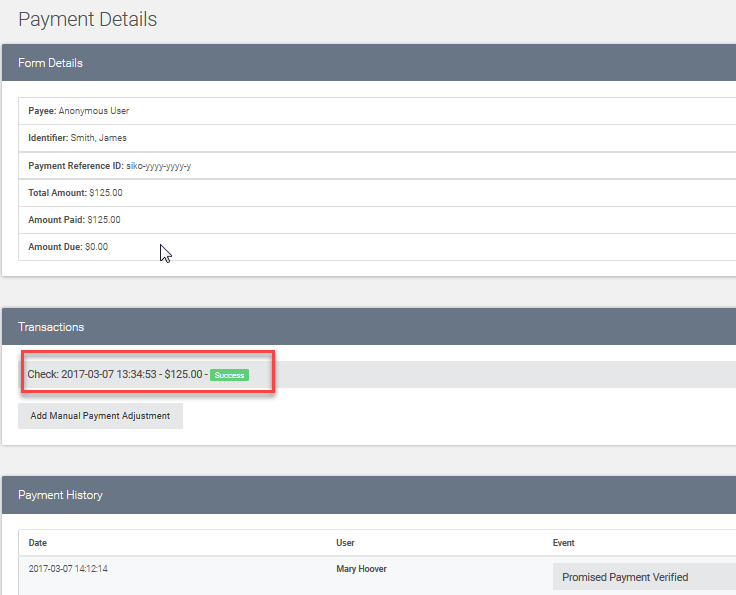 How to reconcile a FormBuilder check payment, once the check has been received from the user making the payment. 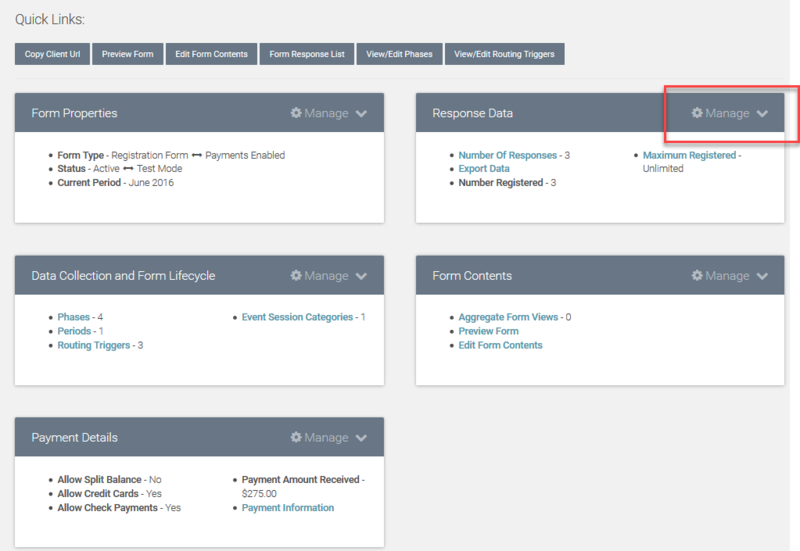 When a user pays for something via FormBuilder with check, they are essentially "promising" to pay and their registration is not complete until they have sent their check. Once the unit receives the given check, the administrator must then mark that check transaction as paid to change the Payment Status for the given form response from "Promised" to "Success". By reconciling the checks once the unit receives them...they will have an accurate count of which check transactions have been received and reconciled, and which checks are still outstanding. If the given form accepts check payments, make sure to include Transaction Payment Status and Transaction Payment Method as fields on your report so that an administrator can tell which checks have been received and reconciled. This is an example of a check transaction that has not yet been received and Marked as Paid, as the Transaction Payment Status shows as "Promised". Report - with a check transaction "unreconciled" including Transaction Payment Status and Transaction Payment Method. 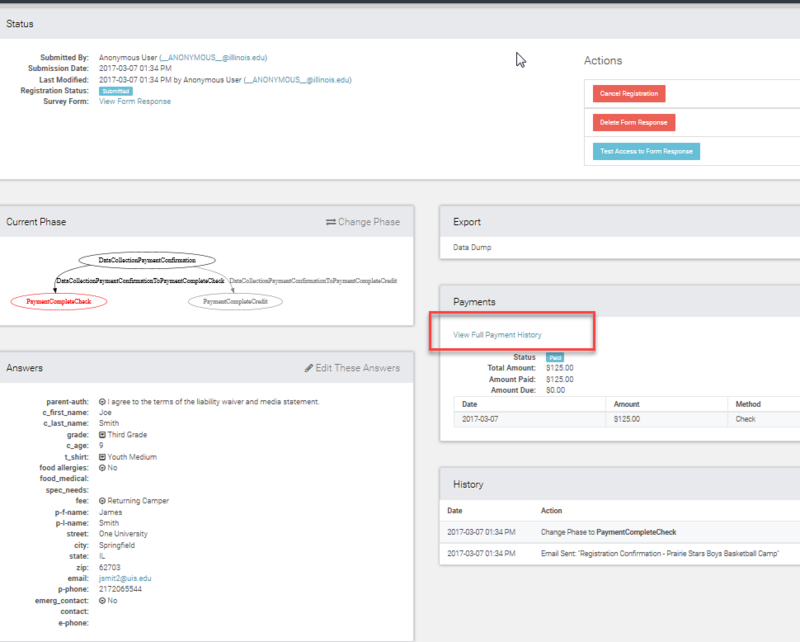 Once the given check has been received by the unit, an administrator from the unit will need to access the given transaction in Response Data/Manage. Search on Last Name by typing in the last name in the Search field. Once transaction is found on the Payment Console, access the payment details by clicking Details. Note the Transaction Status below shows as "Promised" at this point, indicating that the check has not yet been reconciled. Expand the Payment Details by clicking on the check. Click on the Mark as Paid button. 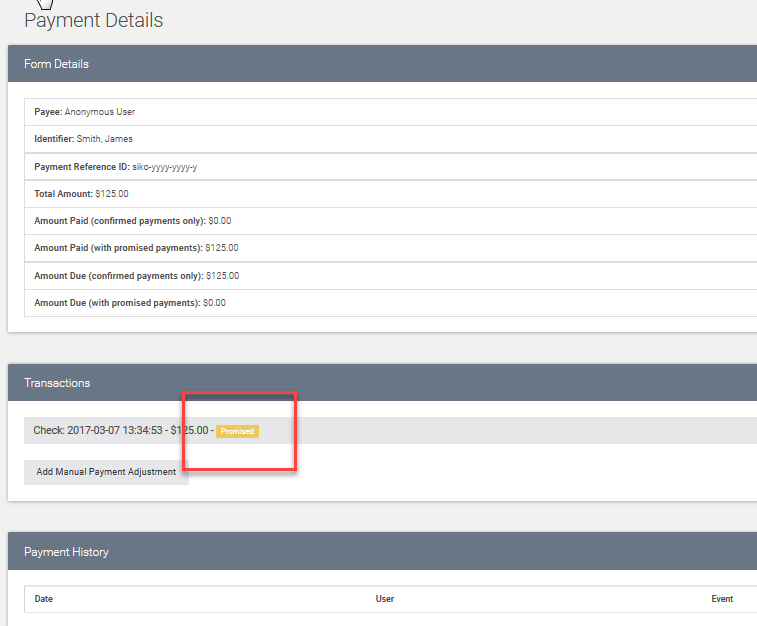 Select Mark as Paid to add payment notes and reconcile the check as Paid and received and click Save. Once the check has been successfully "Marked as Paid" and thus reconciled, the status will now show as Success, which will indicate to you that the check has been received and reconciled. 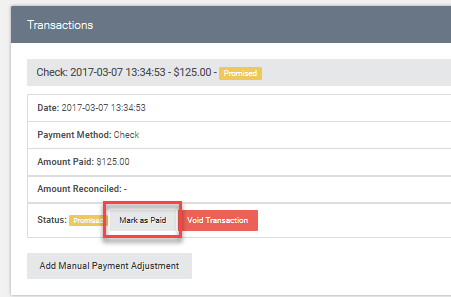 Payments Details - Successfully reconciled check and marked as paid.